Tomorrow is March? How is that even possible? Since I was gone for an extended weekend, I have spent time this week catching up on my real job (and dreaming about sewing...). I showed this picture on WIP Wednesday yesterday, a block that I completed in a hurry right before packing up to leave the quilting retreat on Sunday. Oops. And yesterday I opened the garage door to leave for a bit, and noticed this across the street. Hmmmm....not good. Turns out, a guy had robbed a liquor store about half a mile away, and made the getaway, not successfully of course, on his bicycle! Random question: I have spent the first two months of 2013 really not blogging more than the weekly Really Random, but I am considering restarting The Name Game. Thoughts? 2 different shoes yikes!! Did anyone notice? You could be on to something with that swoon block! I loved the name game and would welcome its return! Heehee... love the shoes! Did anybody notice? What did Charlotte say? Oh dear! I'd love it if you restarted The Name Game! Love the shoes! I worry about that all the time & often check as I'm driving to work! And the name game: I enjoyed it & loved participating in it. oh, and I love your Swoon! I've done the shoe thing before:) The bicycle get away made me laugh. I really enjoyed the name game and would love to see you bring it back. I'm kind of nosey that way! Well...let's see....I've done blocks wrong, I've worn mismatched shoes and even sprayed glass cleaner for hair spray so you aren't alone. Don't worry yet. 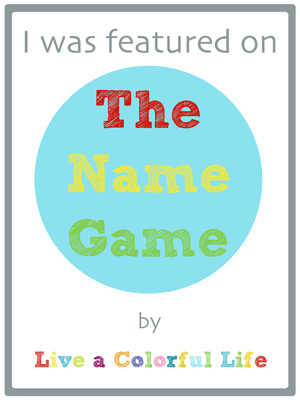 I always enjoyed meeting new bloggers with the name game so I would love to see it back. Lets just say I can relate to the oopses! The bike getaway "car" is not as unusual as you might think. I live south of San Diego, in Imperial Beach, CA, and about 15 yrs ago, my daughter's really nice, expensive bike was stolen out of our garage, aided by an idiot neighbor, and later used as a getaway bike. He, too, ditched it and fled on FOOT! No one ever said that our criminals are smart! We thought it was gone for good, but, luckily, it was licensed and we finally got it back-----dusty and with flat tires-----but it was all in 1 piece. The police had impounded it, and we didn't hear about it until a couple of years later after his "speedy" trial and it was used as evidence. Love your block, and I would love to see more posts from you. You're one of my favorite bloggers. YES!!!!! Bring back the Name Game!! Cindy! You crack me up! Two different shoes??? Oh my. I think I did the same thing while making that block : ) Love the new 'look' for shoes. I love the Name Game! Lease bring it back! I wore two different shoes to work once- they were what we call court shoes (like a pump, I think?) One was black, the other was navy blue! I felt rather silly! I love the Name Game so I'd love to see it again. I'd be happy to be featured too!! Your shoes are the best ever!!! Yes to return of the Name Game! Oh, I've done that before with the shoes! I miss seeing the Name Game posts. Now you can add helping me sort out my commenting replies to your randomness! Oh funny feet! My best buddy has done that! And yes to the name game! I would love to jump in and say that i too, would love to be featured! So have you decided to leave the block as is and not change it back to perfection? This is one reason why I love your blog. I can identify with you so much (referring to the shoes). I sat in my kitchen by myself and laughed out loud, literally. I love how vulnerable you are and share your mistakes to the world. The name game was fun. 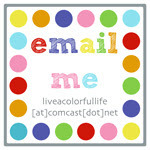 In fact I think that is how I first found your blog - a link from someone I followed who was playing the name game. I think your mix ups this week are a sign of an overfull brain. Time to "peace out" for a while. Or maybe "piece out"! 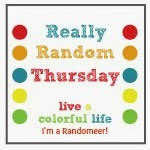 Having a high GOOBER factor is normal in my world, so relax and enjoy the randomness is offers! Love your subtitle for your blog. We are sympatico. I have worn two different shoes to work before! haha! So funny!